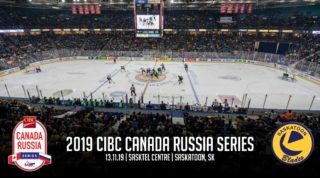 Saskatoon, SK – Saskatoon returned to home ice on Saturday night looking to make it two straight wins at SaskTel Centre but stumbled to a 4-1 loss to Kamloops with the Blazers’ grit proving too much to handle for the sleepy Blades. Rookie net minder Nolan Maier was firm in net for Saskatoon, continuing his strong play of late with 25 saves from 28 shots faced and Libor Hájek scored his 8th goal of the season in the third period, but it was another case of too little, too late with Kamloops digging in after taking a 3 goal lead by the half-way point of the match. A chippy first period was filled with physical action as the referees put their whistles away until Jamaican born Blazer Jermaine Loewen took Blades’ Captain Evan Fiala down with a late charge. 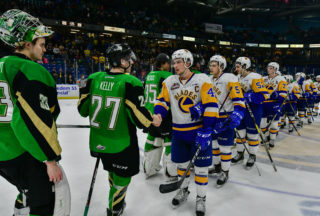 Fiala’s defensive partner, Jackson Caller, answered the call for his captain and joined Loewen (5PIM for fighting, 2 for charging) in the box for 7 seven minutes, 5 for fighting and 2 for unsportsmanlike conduct. The physicality continued into the rest of the game. Kamloops lit the lamp first with 1:05 left in the first period. Controlling the puck behind Nolan Maier and the Blades’ net, Nick Chyzowski threw a spinning backhand on net which Maier saved with his pads only for Luc Smith to collect the rebound and score on his own backhanded attempt. The period ended with the Blazers leading the shot count 13-10. 1:43 into the second period and the Blazers struck again to take a 2-0 lead courtesy of a Luke Zazula shot from close range squeaking its way through Maier’s five-hole. 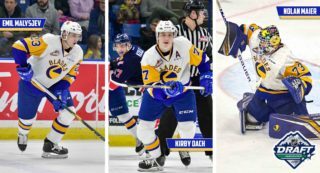 The teams then traded penalties and power plays until the Blazers’ extra-man-unit cracked the Blades’ penalty killing corps with Nick Chyzowski tapping home a point-blank rebound set up from a booming point shot 11:53 into the second period. The second period finished with Kamloops leading on the scoreboard and in the shot count, 3-0 and 21-17 respectively. The teams once again traded penalties to start the third period before the Blades got on the board with an even strength goal. Libor Hájek decided he had seen enough and ripped in a clean wrister from the slot to set the score at 3-1 Blazers, his 8th goal of the season. Bradly Goethals earned an assist setting up the goal. 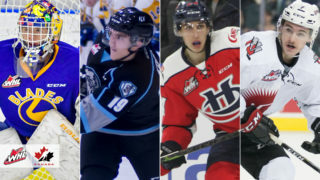 A late penalty to Kamloops nor pulling Maier for an extra-attacker late in the game was not enough for Saskatoon to overcome the odds as the Saskatoon product Garrett Pilon sealed the result for the Blazers, seeing the score finish at 4-1 to the visitors after an empty net goal. 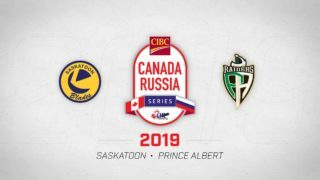 The Saskatoon Blades have no time to mull over their loss tonight as they’re back in action immediately tomorrow for a Sunday afternoon matinee match-up with the Prince Albert Raiders. It’s the Blades annual Teddy Bear Toss game and the opening face-off is set for 2:00pm.